I saw sketch over at Frosted Designs, and I had to stop everything and create a card for the challenge. I so love circle cards! This card was made almost entirely with the Close To My Heart's exclusive Cricut Art Philosophy cartridge. (Don't forget - this is the month you can get the collection free when you join Close To My Heart! Read about it HERE.) The circle card base, circle layer, banner, flowers, and flourishes are all die-cuts. I added some cocoa embellishments and twine, and this card was done in under 30 minutes. I love that about the AP cartridge! It makes crafting quick and easy. With 700 more images, I'd better head back and see what else I can create!! What a beautiful card, Brenda! I just love it. This card is just gorgeous! I love the 3-D effect! Thank you for joining us at Frosted Designs! Your card is so beautiful! I can't believe how much detail there is. Thank you for joining us at Frosted Designs! Beauuuuuuutiful! Great dimension. Awesome colors. Thanks for playing with Frosted Designs. I really like this version of the sketch. The twine is a nice detail, and I think the colors are great. this card is spectacular!! love it! 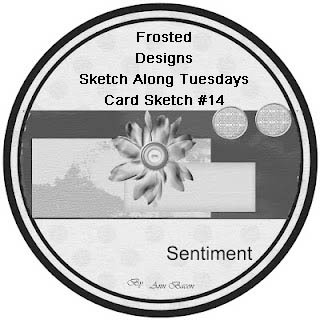 thank you for joining in at Frosted Designs this week!